Invert Sports official goal is to offer the best wakeboard and water ski and surf boats, watercraft rentals, boat charter, and wake sports available to everyone. Not just another sport; a revolution, of innovation, and lifestyle to elevate your involvement with water sports, build lasting memories with associates, family, and friends. Our company is personally committed and dedication to the water sports movement, and we decided to do something no other company has ever done; provide the latest, newest, and best performing watercraft for all wake sports. Our business is customer service. We enjoy the challenge of adapting to our customers' various schedules, requests and consistently exceeding their overall expectations. The Invert Sports Wakesports team is a group of trained individuals who are extremely committed to providing nothing less than the best possible level of executive services to our customers. We offer great solution for your corporate events, family reunions, parties, and team building activities. 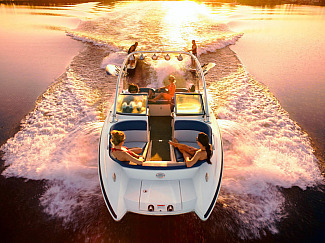 Invert Sports was created for people who love boating by people who love boating. We understand that everyone doesn't always have the means or the time to deal with boat ownership. Service is our business, and we are dedicated to providing our clients with the best possible experience on the water. Whether you are chartering a boat and driver, or renting a boat on your own, you will not be disappointed with our standards on boats and equipment. We use the best in competition boats from MasterCraft and water sports equipment from Slingshot. We are constantly updating and purchase new equipment every year to make sure our clients are getting the best in water sports equipment! We also offer many services to make your vacation to the lake easy and enjoyable, like delivery and pickup, food services, waverunner rentals, lessons, houseboat rentals, timeshare memberships, boat tours, flyboard water jet pack rentals, and total vacation packages. We can take care of anything you would like us to, just ask!